Petrol filling in mopeds is a problem. 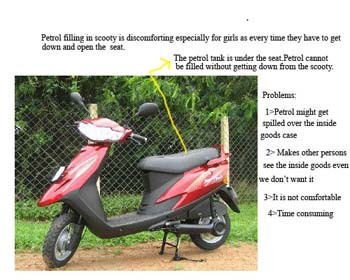 Petrol filling in scooty is discomforting especially for girls as every time they have to get down and open the seat. The petrol tank is under the seat petrol cannot be filled without getting down from the scooty. Petrol might get spilled over the inside goods case. Makes other persons see the inside goods even we don't want it.